[PDF] Judgments of the European Court of Human Rights - Effects and Implementation (Studies of the Max Planck Institute Luxembourg for International, European and Regulatory Procedural Law) | Free eBooks Download - EBOOKEE! 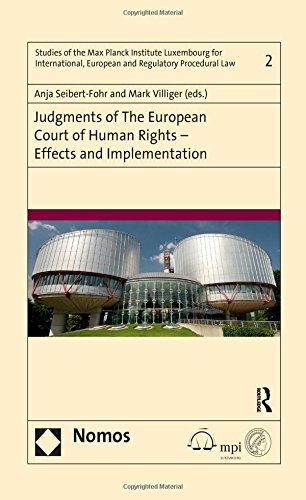 Description: This volume deals with the domestic effects of judgments of the European Court of Human Rights as a challenge to the various levels of legal orders in Europe. The starting point is the divergent impact of the ECtHR's jurisdiction within the Convention States. The volume seeks new methods of orientation at the various legal levels, given the fact that the Strasbourg case law is increasingly important for most areas of society. Topical tendencies in the case law of the Court are highlighted and discussed against the background of the principle of subsidiarity. The book includes a detailed analysis of the scope, reach, consequences and implementation of the Court's judgments and of the issue of concomitant damages. At the same time the volume deals with the role of domestic jurisdictions in implementing the ECtHR's judgments. Distinguished Judges, legal academics and practitioners from various Council of Europe States are among the contributors to this volume, which succeeds in bringing divergent points of view into the discussion and in developing strategies for conflict resolution. No comments for "[PDF] Judgments of the European Court of Human Rights - Effects and Implementation (Studies of the Max Planck Institute Luxembourg for International, European and Regulatory Procedural Law)".